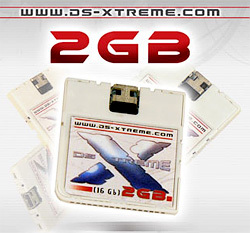 DS-X Cart Upgraded to 2GB | OhGizmo! Even though the update was leaked a few weeks ago by website Divineo.cn today the DS-X development group officially unveiled the latest version of their popular DS-X homebrew cart. Designed for use with the Nintendo DS the cart is the exact same size as a standard game cartridge and now includes 2GB of storage for running homebrew or other software on the handheld. The original version of the DS-X cart contained 512 MB which some users complained about given the lack of expandability via memory cards. However I’ve heard nothing but great things about the original DS-X and I particularly like the fact that it has a mini-USB jack built-in meaning you don’t need to carry around a special reader for copying files to it. It’s completely plug and play and easy to use. The DS-X 2GB cart is currently available for pre-order from Divineo.cn and will sell for $129.95. As I understand it the original 512Mb version of the DS-X cart will also be benefiting from a price cut at the same time. ← Roll Up USB Drum Kit – For Those About To Unroll, We Salute You!